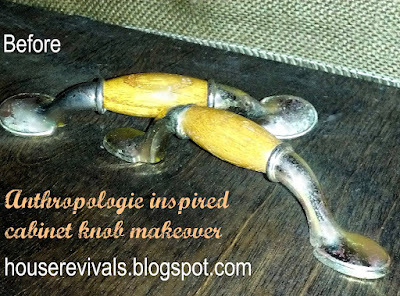 Are you stuck with ugly fake brass and honey oak cabinet hardware that you hate? Here's a quick and inexpensive way to update those old builder grade cabinet handles. This project was inspired by these lovelies from Anthropologie. Gorgeous as they are, they can be pretty pricey when you need to buy twenty or thirty of them for your kitchen. Start by cleaning, priming, and painting your handles. I used an oil rubbed bronze paint from Rustoleum. Next, grab a roll of jute or cotton twine and start wrapping your handles! It's really that easy. Start with a quick over-under knot to secure the end, then tuck the tail back and wrap the twine around the handle and the tail of twine. Trim the tail, if necessary, and continue wrapping to the end, tucking the remaining tail under the loops and securing with a dab of clear drying glue. Not counting the time it takes the paint to dry, this project took less than five minutes per handle! How's that for a super easy and quick update? Absolutely brilliant! I have been putting off my kitchen cabinet remodel because of my taste being more expensive than my budget allows for. Not anymore. I. LOVE. This. No more excuses now I suppose! Thanks for sharing this great idea! I love this idea. I've got an idea for jute twine up my sleeve...but haven't done it yet. If I don't get after it; someone else will. That's how I feel about your handles... they're that good! ...via FJI Junk I love! LOVE these! How brilliant is this idea? So simple and gorgeous! I love it! So simple yet makes such a huge impact. Its all in the details! I found your blog via TT&J, and just became your newest follower! I'd love it if you stopped by my blog to take a look around. If you like what you see, follow me too! Thanks, hope your having a great weekend! These are fantastic and so so easy ~ wow! Fantastic job! I'm pinning this one! This is a really great update to those handles!! They look so much better now!!! Great idea! New hardware can be pricey enough, I love this idea! This is a great idea! We'd love to feature it on CraftFoxes.com as a how-to or project. Interested? Feel free to email me at bethany@craftfoxes.com for more info. This is a great idea. So cute and so much better than buying new pulls. Nice job!I'd love for you to share your post at my blog party, Twirl & Take a Bow at www.houseontheway.com. It's every Tuesday and runs through Sunday. I love for you to stop by! Coleman lanterns are made to operate on a number of different fuels. Some fuels, such as Coleman fuel, also known as white gas, works well in very cold temperatures and high altitudes. Others, like propane, are easy to use and widely available. Love, love, love this idea. 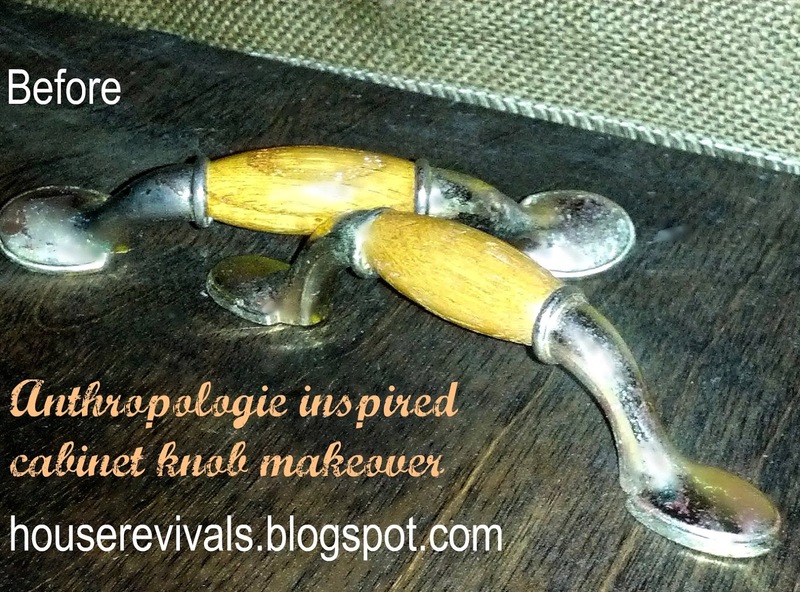 I have the brass with the tan center knobs just like the ones you are showing and hate them! 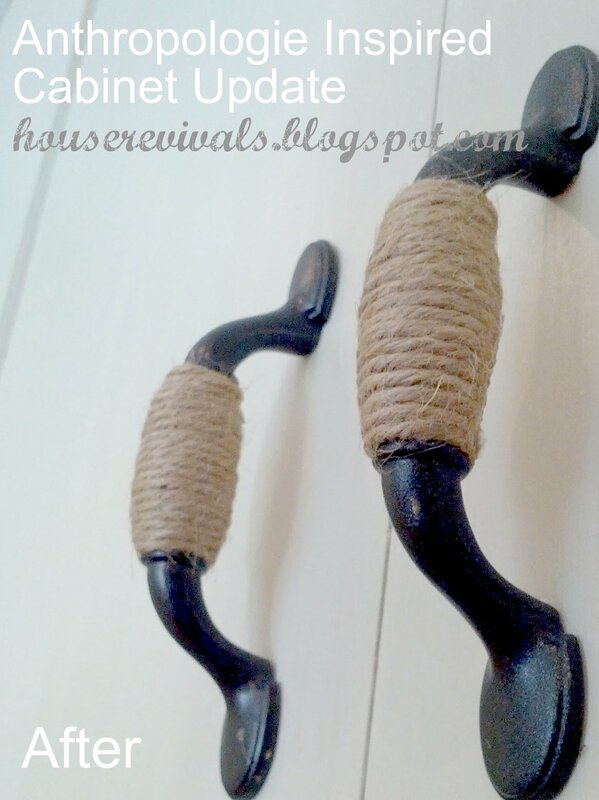 My house is country/primitive and I've been wanting to change them but I need 30 of them for my kitchen and at @ $5.00 a handle, that is $150.00 and wow ... just don't want to pay that for handles. So I am definitely going to do this. Hopefully I can do this weekend. I'll post on my website http://livinglifewright.com when the job is done. Super simple and SO cute! Absolutely love these and had to "pin" them! I think your version is even better than Anthropologie actually! I'm so glad you like the idea! I must confess, that I have found an even better material to wrap the handles with -- hemp! Hemp is much nicer to touch, so I like it a lot more than the jute twine. LOL! I totally kinda did this to my kitchen. I have the same exact handles and painted them the same color! I didn't do anything else, just paint and put them back.Then I just saw this on pinterest and said , those are my handles! Lol Although cute with the twine, mine are staying as is. 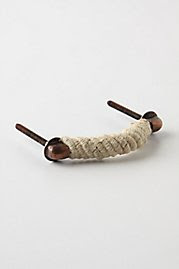 I just thought that was too funny...I wasn't the only one with those ugly handles. That looks great! What a smart idea, thanks for sharing. I'm finding these nearly one year later via Pinterest. My question: how are they now? Has the twine unraveled or started looking dirty? Have you had to redo any of them? Sam, I'm so glad you like these -- they are super easy and quick to do!